Today, I checked my mail for the first time in six days. For some folks, this is probably par for the course. For me, it’s unheard of. As much as I love e-mail and the internet and understand how it has revolutionized the world, I still love getting physical mail. I will freely admit that the USPS discussion about abolishing Saturday service makes me weep. Okay, perhaps that’s an exaggeration, but it does make me a little sad. When I was 12, I started writing to a pen pal on the Isle of Wight for a school project. Like every proud pre-teen girl growing up in the 1980s, I loved stickers. With my allowance, I picked up a copy of Lisa Frank’s magazine. In the back of the issue, there were pen pal ads for sticker traders. I picked one out and started writing to her, as well. It was the start of an obsession. By the time I was in eighth grade, I had over 80 pen pals. I literally spent most of my free time writing letters to people around the world. I had pen pals in Singapore, Canada, Costa Rica, Australia, and all over the U.S. Just like with friends, some were more “acquaintances” who just liked to trade stickers or friendship books, but others I actually got fairly close with and met. I would literally run home after school almost every day to check the mail. On Saturdays, I would sit on the front porch and wait for the mailman to show up. I would get six, seven and eight letters in the mail some days. Tell me, when you know you’re getting something fun in the mail, don’t you still get a little excited about it? I can’t tell you today that I remember many of my pen pals. A handful that I wrote a lot with, really, that’s about it. I am actually friends with a few of them on Facebook and have connected with others. But one…one in particular remains very special to me. 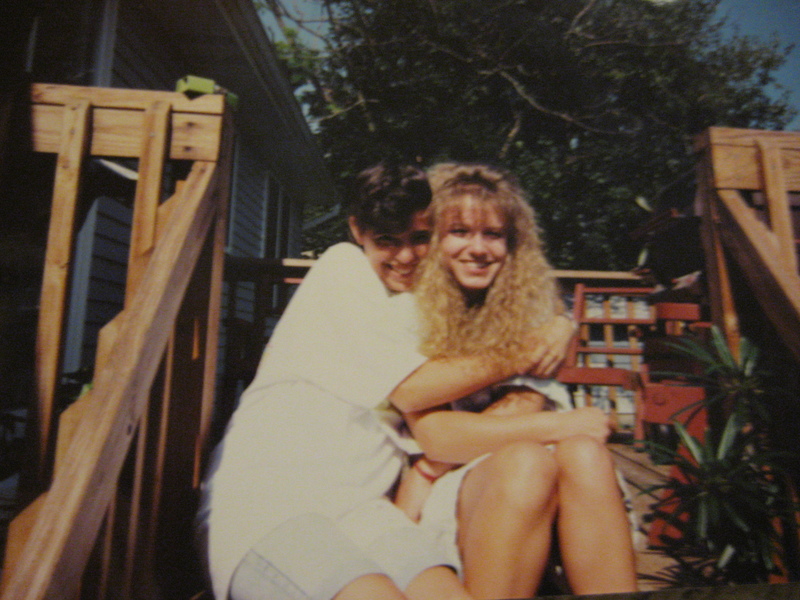 Steph and I started writing in 1988. From the very first letter, our pen pal friendship was different. We started out with full page letters, but within a few months, were writing 8, 9 and 10 page letters to each other. By the time we hit tenth grade, we would literally fill notebooks. We’d start a notebook and write in it for two or three weeks and then send it off. What did we write about for 70 pages? You name it. School. Boys. New Kids on the Block. Our families. The stresses of being the oldest kid in the family. Roller skating. Shopping. Our topics were endless. We finally did get to meet the summer after sophomore year when she flew to New Jersey for my birthday for a week. The scene at the airport was as you can imagine it would have been – two sixteen year olds freaking out. Lots of hugging and giggling! We spent that week doing things that typical best friends would do. We went to the beach and walked on the boardwalk. We ran in the rain. We went to baseball games and movies. We hung out with my friends. We had a birthday party. We sat and read old letters and laughed and laughed and laughed. It was the best week ever. The letter frequency increased after that visit, if at all possible. Over the next few summers, we saved and scrimped to visit each other – hard when you are earning your money babysitting. She came back to New Jersey the next summer, and I flew out to Wisconsin the summer after our senior year, and then in a surprise visit, Steph flew out and spent the week before I went off to college with me. It would be the last visit for a number of years. Her mom got very sick and eventually passed away, and Steph’s life changed drastically as she became the legal guardian of her younger sisters at eighteen. I was at college, trying to figure out my world, and our lives went to very separate ways. We eventually reconnected, and although the letters were never as long or as frequent as they once had been, we have managed to continue writing to this day. Sometimes, we go months without letters, but we still write. And although we vowed never to do it, we’ve finally caved to keeping in touch via computer, sending Facebook notes, etc. 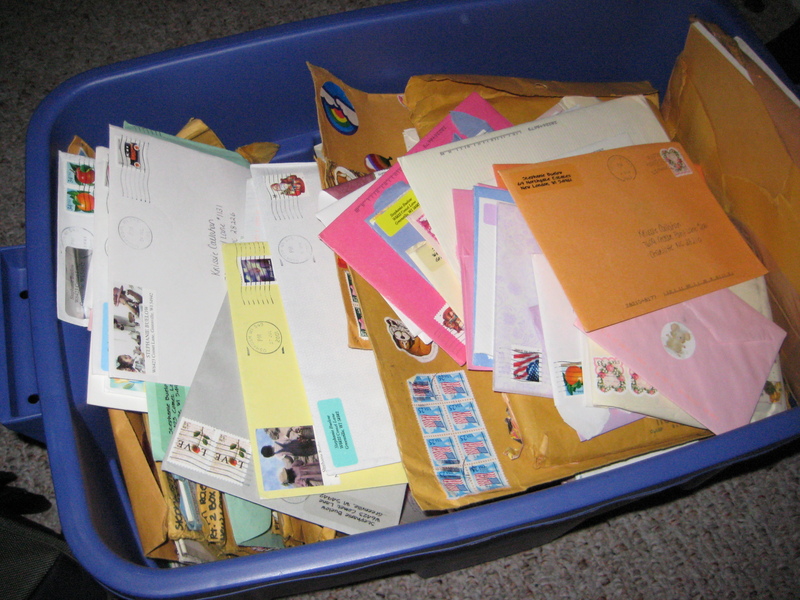 Over the years, I’ve saved every one of Steph’s letters. They sit in the top of my closet in a big blue Rubbermaid tub. Every once in awhile, I pull it down and read a few. They always bring back a flood of emotions – it seems like just yesterday, but in reality, a lot of those letters were written 20 years ago. I remember the stories, the heartbreaks, the confusion, and the laughter we shared at our lives. And while today, our worlds are completely different, Steph will always be one of my best and most treasured friends, no matter the time that passes between letters…And every time I go to my mailbox, there will always be a little piece of me that opens it up and hopes to see a colorful envelope with Steph’s familiar handwriting waiting for me. I try to be good about sending cards and the like to friends, but this year, in honor of my now nearly 22-year friendship with Stephanie, I’m vowing to write at least one real letter to someone once a month. Even if it’s just to say hi. And maybe, I can make someone’s day with a brightly colored envelope waiting in their mailbox. This entry was posted in Friends & Family, Writing and tagged letters, pen pals, stephanie, Writing by Krissie. Bookmark the permalink. Loved your post and you’re absolutely right; writing a letter means so much more than sending an email. Your entry took me back to my days in college – the pre-email days – and the joy I had of walking over to my little PO Box on campus and getting a letter from my girlfriend at the time. It was fun and exciting, and it conveyed so much more feeling than anything electronic ever could. I feel sad for my kids as they grow up in this brave, new e-world. Writing letters is a dying art, and I am glad you’ve rekindled your passion for it.